On This Day In History in 1666, London suffered the start of a four day intense heat wave. 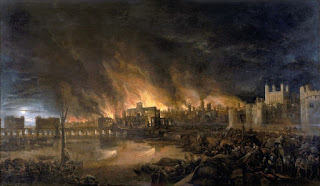 It became known as the Great Fire of London. The fire started in a baker's shop in Pudding Lane and spread throughout the city, destroying over 13,000 houses, almost 90 churches, and the world famous St Paul's Cathedral. Even though half the city was destroyed, only 6 people died. Fun Fact: Samuel Pepys, the famous diarist, lived in a house directly in the path of the fire. Yet, instead of making sure his diary was safe, he buried his parmesan cheese in his back garden to protect it from the fire.